The Google Play Developer Console makes a wealth of data available to you so you have the insight needed to successfully publish, grow, and monetize your apps and games. We appreciate that some developers want to access and analyze their data beyond the visualization offered today in the Developer Console, which is why we’ve made financial information, crash data, and user reviews available for export. We're now also making all the statistics on your apps and games (installs, ratings, GCM usage, etc.) accessible via Google Cloud Storage. We’ve added a Reports tab to the Developer Console so that you can view and access all available data exports in one place. This is the easiest and most reliable way to download your Google Play Developer Console statistics. 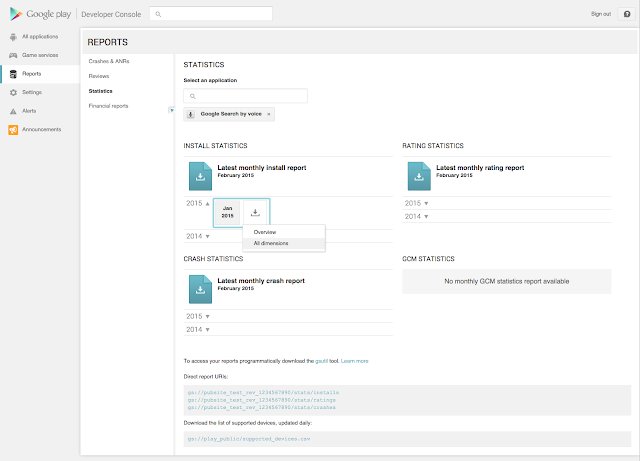 You can access all of your reports, including install statistics, reviews, crashes, and revenue. Authenticate to your account using your Google Play Developer Console credentials. Find your reporting bucket ID on the new Reports section. Use the gsutil ls command to list directories/reports and gsutil cp to copy the reports. Your reports are organized in directories by package name, as well as year and month of their creation. Read more about exporting report data in the Google Play Developer Help Center. Note about data ownership on Google Play and Cloud Platform: Your Google Play developer account is gaining access to a dedicated, read-only Google Cloud Storage bucket owned by Google Play. If you’re a Google Cloud Storage customer, the rest of your data is unaffected and not connected to your Google Play developer account. Google Cloud Storage customers can find out more about their data storage on the terms of service page. Cloud Tools for Android Studio allows you to simultaneously build the service- and client-side of your mobile app. 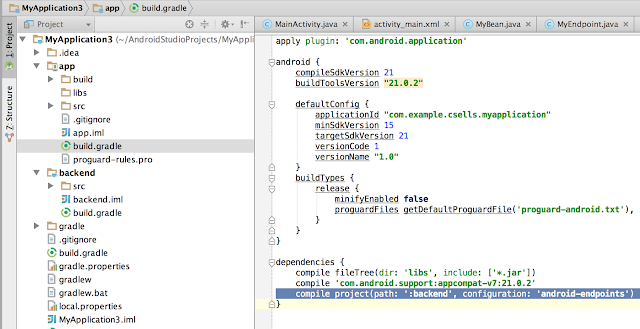 Earlier this month, we announced the release of Android Studio 1.0 that showed just how much raw functionality there is available for Android app developers. However, the client isn’t the whole picture, as most mobile apps also need one or more web services. 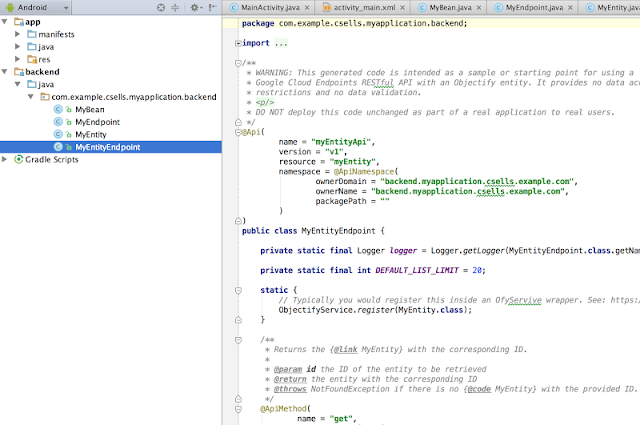 It was for this reason that the Cloud Tools for Android Studio were created. 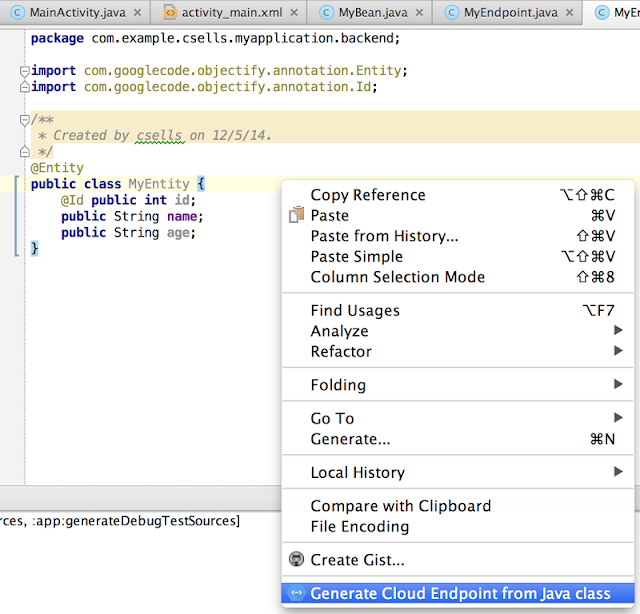 Cloud Tools put the power of Google App Engine in the same IDE alongside of your mobile client, giving you all the same Java language tools for both sides of your app, as well as making it far easier for you to keep them in sync as each of them changes. 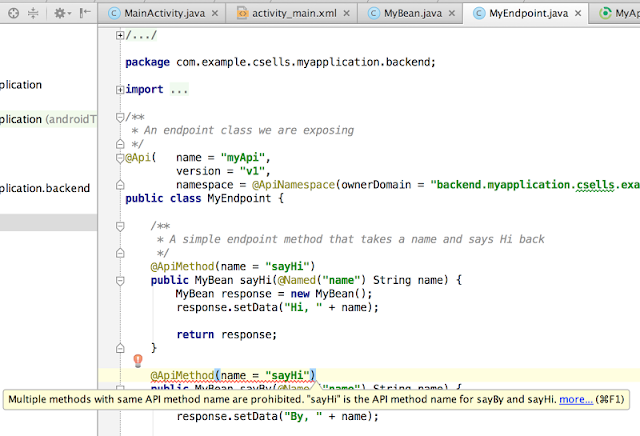 The Java Servlet Module gives you a plain servlet class for you to implement as you see fit. If you’d like help building your REST endpoints with declarative routing and HTTP verbs and automatic Java object serialization to and from JSON, then you’ll want the Java Endpoints Module. If you want the power of endpoints, along with the ability to send notifications from your server to your clients, then choose Backend with Google Cloud Messaging. Instead of writing the code to create HTTP requests by hand, you can make calls via the library in a typesafe manner and the marshalling from JSON to Java will be handled for you, just like on the server-side (but in reverse, of course). Here, Cloud Tools have found a duplicate name in the ApiMethod attribute, which is easy to do if you’re creating a new method from an existing method. 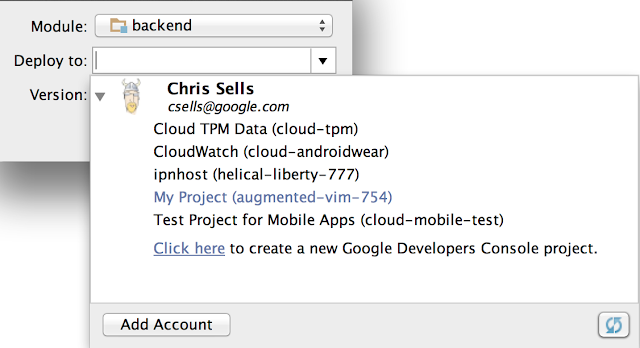 Cloud Tools beta required some extra copying and pasting to get the Google login to work, but all of that’s gone now in this release. We’re excited to get this release into your hands, so if you’ve haven’t downloaded it yet, then go download Android Studio 1.0 right now! To take advantage of Cloud Tools for Android Studio, you’ll want to sign up for a free Google Cloud Platform trial. 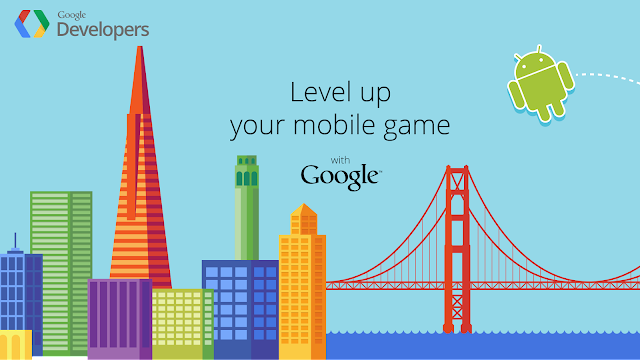 Nothing is stopping you from building great Android apps from front to back. If you’ve got suggestions, drop us a line so that we can keep improving. 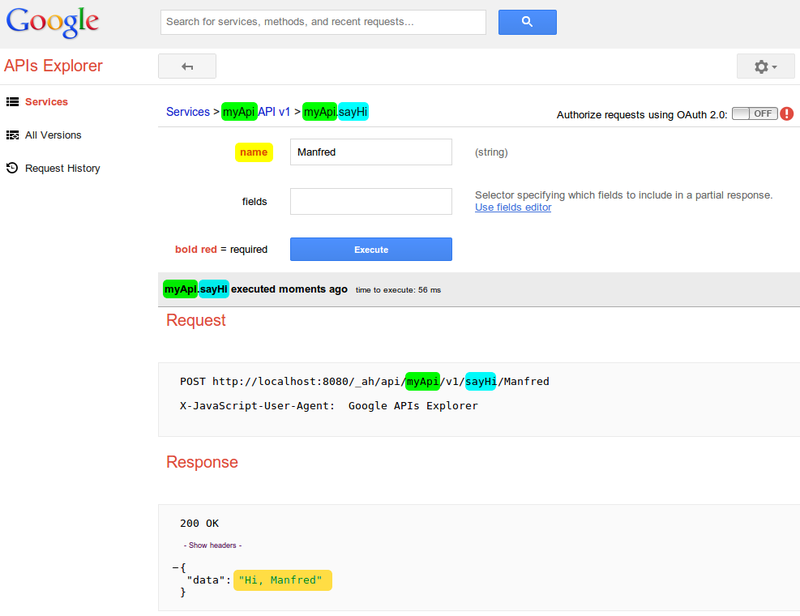 We’re just getting started putting Google Cloud Platform tools in your hands. We can’t wait to see what you’ll build. 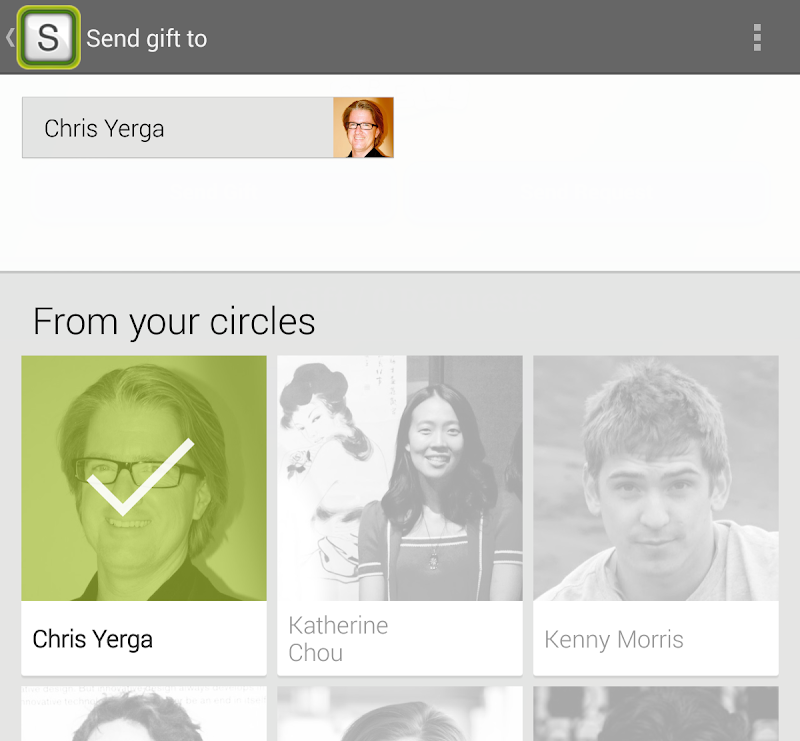 Many Android developers like Snapchat or Pulse build and host their app backends on the Google Cloud Platform, and enjoy automatic management, with simple expansion to support millions of users. 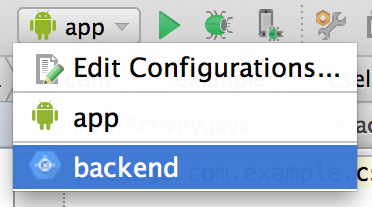 To quickly add a Google Cloud Platform backend to your Android app, you can now use a number of built-in features in Android Studio 0.6.1+. 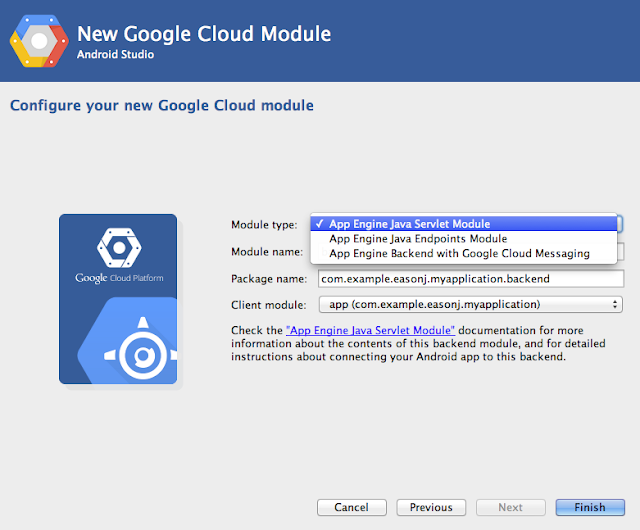 Google App Engine enables you to run your backend applications on Google's infrastructure, without ever requiring you to maintain any servers. 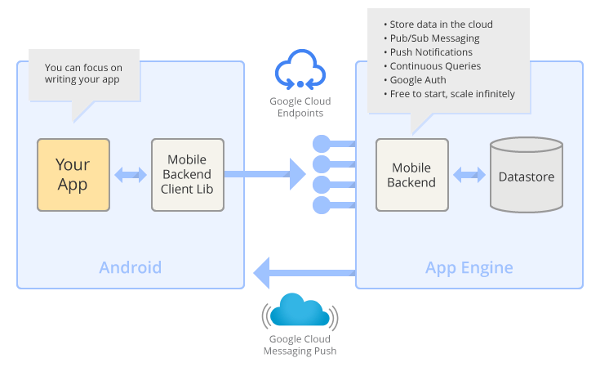 App Engine Backend with Google Cloud Messaging includes both Google Cloud Endpoints and Google Cloud Messaging integration, which enables additional features like push notifications. When you choose one of these template types, a new Gradle module with your specified module/package name will be added to your project containing your new App Engine backend. All of the required dependencies/permissions will be automatically set up for you. You can then run it locally (on http://localhost:8080) by selecting the run configuration with your backend's module name, as shown in the image below. 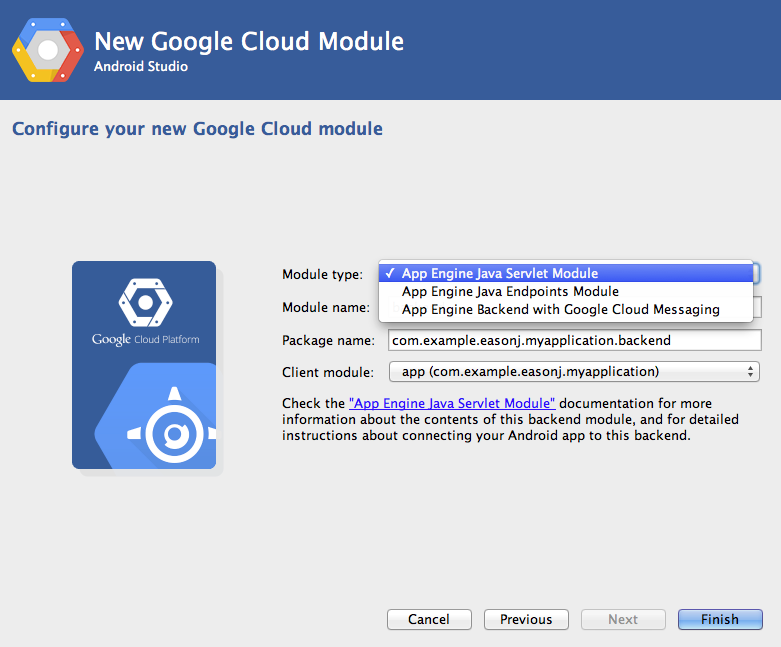 Once you have added the backend module to your Android application, you can use Google Cloud Endpoints to streamline the communication between your backend and your Android app. Cloud Endpoints automatically generate strongly-typed client libraries from simple Java server-side API annotations, automate Java object marshalling to and from JSON, provide built-in OAuth 2.0 support and so on. Google APIs explorer is available at http://localhost:8080/_ah/api/explorer once you deploy your app. 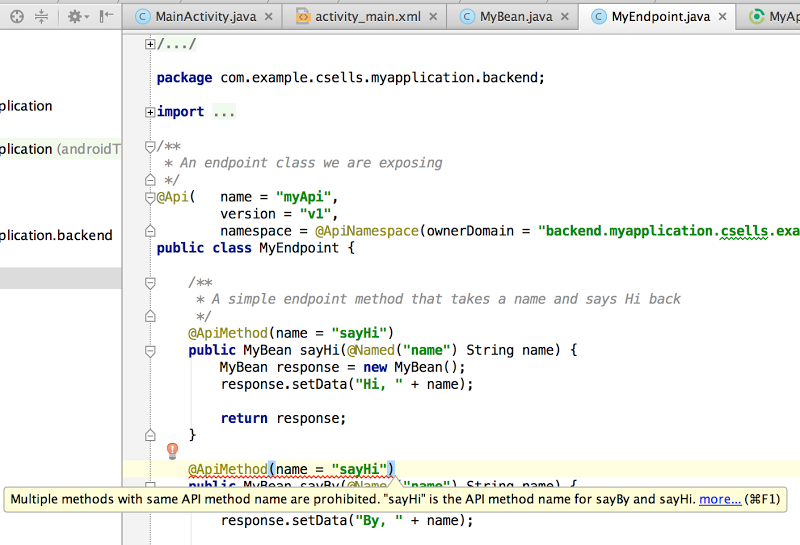 Color overlays in this screenshot match the colors in the API snippet above (MyEndpoint.java). 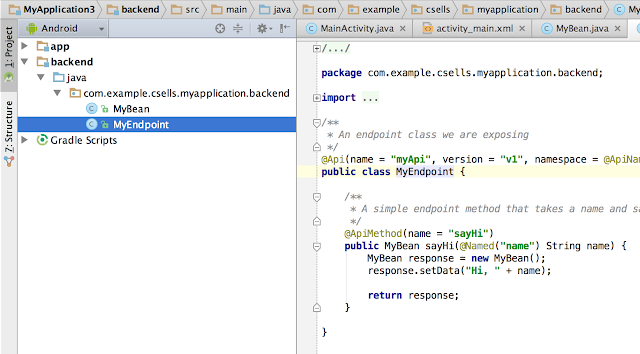 As server-side Endpoints API definitions have to conform to a number of syntactic rules, Android Studio also includes a number of Endpoints-specific inspections and quick-fixes, which help you to avoid mistakes when writing Endpoints APIs. As expected, choosing the first quick-fix ("Add @Named") will automatically add "@Named" annotation to method's parameter, solving this problem in two key presses. Under the hood, Gradle is used to build both your app and your App Engine backend. In fact, when you add an App Engine backend to your Android app, an open-source App Engine plug-in for Gradle is automatically downloaded by Android Studio, and common App Engine tasks become available as Gradle targets. This allows you to use the same build system across your IDE, command-line or continuous integration environments. Similarly, if you want to integrate your backend's deployment into your command-line scripts, simply launch "./gradlew backend:appengineUpdate" command from your project's root directory. 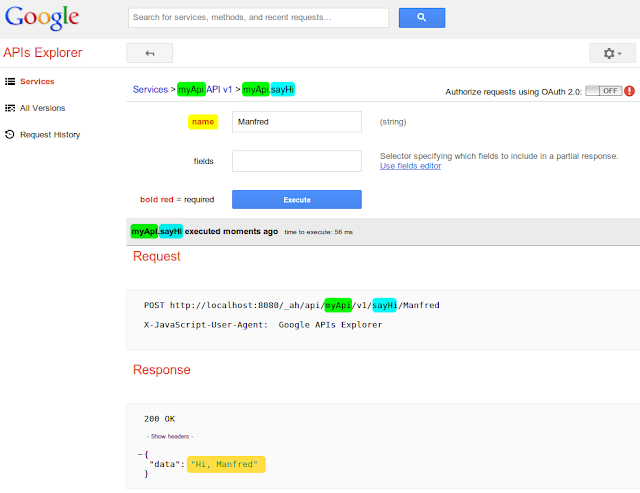 Try out a codelab, or see these features live at Google I/O 2014! 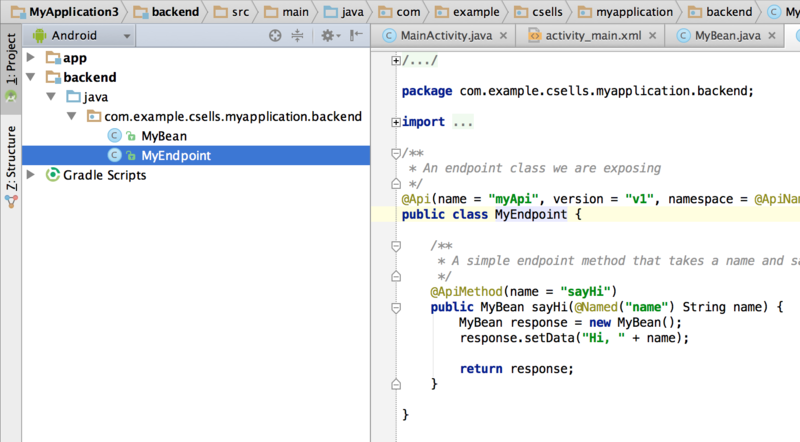 If you want to give these features a spin in a more guided environment, try out our Cloud Endpoints codelab for Android. We will also be demonstrating some of these features live at Less Code, More Services, Better Android Apps session in Google I/O 2014 (as well as some of the new and even more exciting stuff), so don't forget to tune in! 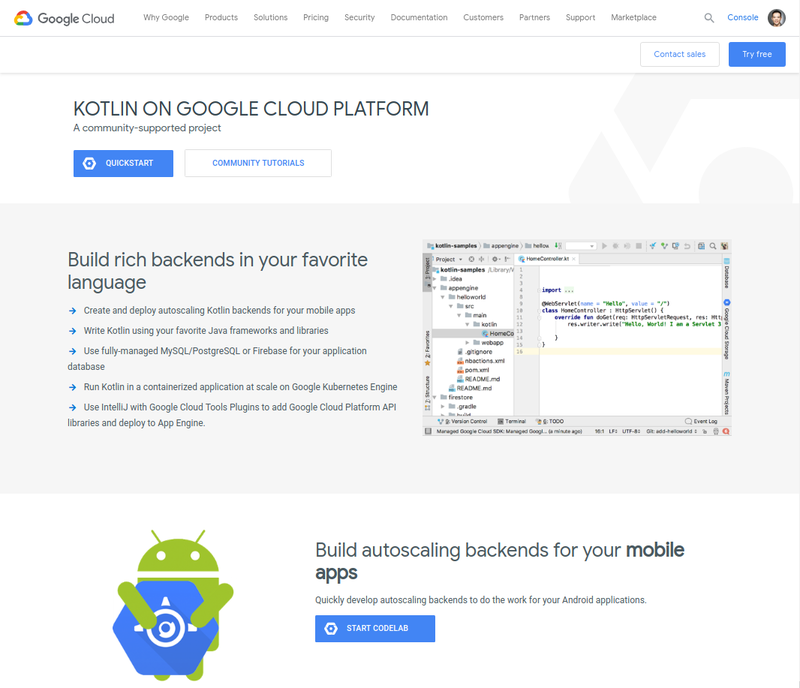 We look forward to your questions or feedback, and learning about the amazing applications you have built using Android Studio and Google Cloud Platform. You can find us lurking on StackOverflow's App Engine and Cloud Endpoints forums!